Apple takes 20%, so Rebellion offers cheaper pricing if you go direct. To counter this somewhat, the app gives you back issues: subscribe for a month and you get a month of issues for free. Note that as far as I'm aware, however you subscribe, Rebellion offers alternate means of reading your Prog. So subscribe in-app, and you can use your Rebellion ID to sign into the website and grab DRM-free copies to read in an app of your choosing (be that Chunky on iPad, Simple Comic on a Mac, or whatever). Hi - that's not entirely true, first time digital subscribers who purchase via the 2000 AD web shop also give you the same amount of free back issues as the apps i.e. It doesn't matter where you first purchase a digital subscription, you still get the same amount of free back issues. Also, as far as I know, Apple actually take a 30% cut of all in-app sales (as do Google), not 20%. Direct sales via the 2000 AD web shop ensure that more of your money goes direct to Rebellion, helping to fund additional Thrill Power. "Rebellion offers alternate means of reading your Prog. So subscribe in-app, and you can use your Rebellion ID to sign into the website and grab DRM-free copies to read in an app of your choosing"
Has new security software been installed on the shop? Very effective I must say. Won't let me log-in, create a new account or actually buy anything. Can't get more secure than that. Apologies if no one has got back to you sooner, but are you still experiencing log-in problems with the 2000 AD shop? Have you tried requesting a password reset email? The shop does appear to be working normally. Hi - I've now bumped your status to "Member", which should sort things out, do let me know if it hasn't! For the record, roughly a couple weeks ago the registration feature finally worked. There are still a couple bugs (of which I can't recall what they were exactly atm), yet I was finally able to register. Great, glad to hear it. Do let us know if you encounter any other issues - though these are best reported through the "Contact Us" form on the 2000 AD web shop (i.e. 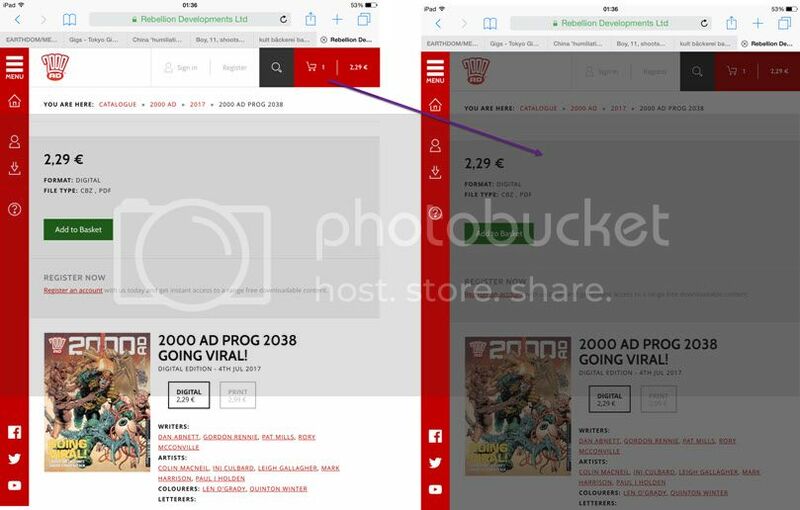 https://shop.2000ad.com/contact-us ), selecting the Enquiry option "Website Technical Problems", as all these enquiries are tracked. Thanks! Anyone else getting this? says the security cert has expired? BTW just to confirm/clarify, we don't ever actually store any payment card details ourselves on our own servers, any payment card details that are stored are stored with our payment provider, Stripe (see: https://stripe.com/ ), which is a regulated payment provider. For cards details that have previously been stored with Stripe via the 2000 AD web shop, we just reference these for payment via a secure "token", but we never actually see the card details ourselves. I know this doesn't address the current issue of not always displaying the amount to be charged before asking for card details, but thought you might like to know that we don't actually hold card details ourselves. Hi - this is something we're looking into, as well as the checkout flow in general, as we're not entirely happy with how it currently works. Certainly agree that having the order details and amount displayed before payment is something that should always happen, in fact should probably show this throughout the whole checkout process . We'd also like to be able to offer some kind of estimated delivery cost amount, even if you're not logged in. Also expect to see some further significant improvements to the shop released in batches over the next few months (e.g. we've started to add Preview images to products, at least the new ones). Is this shop.2000ad.com or account.rebellion.co.uk? Definitely on shop.2000ad.com, can't remember if it's a problem on the rebellion portal. That's odd, are you sure? The checkout on the shop.2000ad.com website seems to be working okay at the moment, though does seem to be bugged on the shop on the account.rebellion.co.uk site - on the latter site, if you click on your basket, the content should be shown in the slide out on the right, but this displays completely blank. In my case, it's definitely from the shop, rather than the portal. Here's how it looked when I tried to buy today's Prog. The same greyed out emptiness and I can't scroll to the side at all. I did inadvertently find a workaround though! If I turn my iPad to landscape view, I can see the buttons which let me get to the checkout from the product page. Huzzah! Not sure if Mardroid cn turn his laptop up on its end. 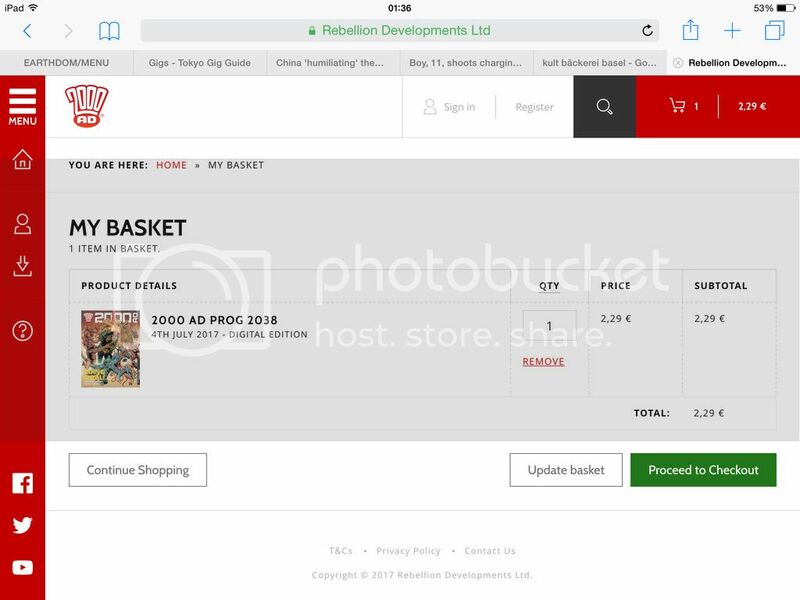 I can't reproduce this on our office iPad, when I click the basket icon in portrait mode, the basket slides out from the right hand side. Are you able to us know which iPad model you're using and which version of iOS this is on? Okay, thanks, sounds like it may be an iPad-specific problem it's still an issue, we'll investigate further. Sorry about this. Presumably also, buying from the 2000 AD shop leaves a bigger cut for Rebellion/2000 AD? I've no idea what back-end's being used there, but anything bought through Apple means Apple takes a hefty cut. I notice that the graphic novel prices are currently higher through the iPad app but if I go to the online store I can get the digital version usually for £3 cheaper and then it shows up on my iPad. Lovely. Is this a deliberate pricing policy to reflect the costs you have to pay to apple for handling digital content? Bu the way, thanks for having the feature that stops me buying digital content I already. Saved me another £9.99. Hi Eamon - this isn't actually a deliberate pricing policy change, we do actually try to harmonise prices across all our retail platforms and recently reviewed (and in a number of cases lowered) our Prog, Meg and subscription pricing. It's due to Apple putting up the UK price for some of their pricing tiers recently. We will review the digital graphic novel pricing very soon to bring the UK pricing back to previous levels across all our platforms (i.e. to £9.99 in most cases). In the meantime, as you noticed, you can still purchase digital graphic novels at the original price point via the 2000 AD web shop https://shop.2000ad.com/catalogue/graphic-novels, and any purchases made there will be available to download and view via our iOS 2000 AD app (in any of our 2000 AD reader apps, in fact). BTW we're aware the 2000 AD web shop is quite slow at the moment, but are currently working on some major performance optimisations which we hope to be able to put in place soon. Hi Dave - Is it still doing this? I can't reproduce this our end. The DNS changes ought to have filtered through to everywhere by now, though possibly not. Have you tried clearing your web browser's cache?